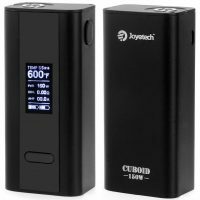 Cuboid’s firmware is upgradeable from 150 watt standard to a 200 watt device via a download file on Joyetech’s website. Heavy mod, very solid build & feels great in the hand. 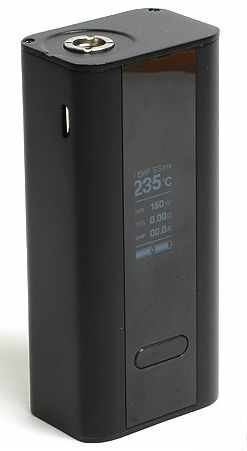 First week with the Cuboid I was experiencing a continous “Atomizer Short” error. If I vape on the Cuboid continuously, the Cuboid vapes just fine. When sitting down for 10 minutes or longer… “Atomizer Short”. The only thing that will clear it for me. Unscrewing the atomizer completely off and back on again. Repeat, repeat again, repeat again, repeat again. See 2nd Update Down Below – 10 Months later Atomizer Short AGAIN! I went back to vape shop here where I purchased. They took my RDA off my Cuboid and tested the coil on 2 other devices,, coil tested in on these other devices at .08-.09 and would not fire on there own devices. As the specifications above, the Cuboid needs a coil resistance reading of at least .10 ohm’s. On my Cuboid same RDA was reading .17, (parallel coil setup) on her own device and ohm meter .08. Something was not right with my coil. They adjusted my coil (using heat and ceramic tweezers), and rewicked with fresh cotton. She screwed my RDA (Glacier 2) on the Cuboid. Coil then reported .13 on my Cuboid and fired perfectly. Told her to put it down and let it sit for a few minutes. Went back over to few minutes later and it fired perfectly again. The vape shop initially built this first coil which was a parallel coil setup for me when I purchased the Cuboid. Grub screw(s) to the coils might of loosened up, possibly. It has now been 4 months (as of May 9, 2016) with out any “Atomizer Short”. Using multiple rda’s now with no more “Atomizer Short”. If have this problem, double check your rda coil readout on another device or ohm meter. Well folks,,, after 6 months with no problems, atomizer short again! Apparently from what I was able to find out from local vape shop. The cuboids 510 pin is faulty, and gets stuck down in the cuboid. Down enough to ground out on the inside of the cuboid itself. Unscrewing the atomizer completely off cuboid and back on stops the problem for only a short while. I have now taken an old credit card (or gift card) drilled a 510 hole in it (to fit atomizer bottom of RDA 510 POST). Using scissors, with credit card on RDA base cutting the credit card around base of RDA (creates a round spacer). Basically a quarter size spacer disk with 510 hole drilled in center. This creates a spacer between RDA and cuboid to prevent the Cuboids center 510 pin from being pushed down to far into Cuboid. Right now this is currently working. You’ll find multiple videos on youtube about this. Have drilled out and cut a few extra “gift card spacers” for my other RDA’s. So far several months later, the “spacer” has cured the “no atomizer” short. The Cuboid runs on 2 – 18650 re-chargeable batteries. I’m using MXJO IMR 18650 Battery 3000 MAH 35A 3.7V High Drain batteries from eBay. These 2 batteries at local vape shop = $28! I get about 1.5 – 2 days of moderate vaping at about 50 watts. Both batteries drain equally in the Cuboid. Coming from regular EGO style batteries, you do need to get use to the vapor and throat hit on these high wattage mods. (Working my way up on wattage). Currently been using 18mg of nicotine,,, vape shop advised me to cut the nicotine back due to the difference in throat hit AND vapor on the Cuboid. I asked “what 12, 10? ?” They said “no more like 6mg nic, so that’s what I went with. It is true about dropping down on your nicotine, for I had some 18mg eliquid still around which was fine in a regular ego clearomizer, and drop a few drops in the rda and it is VERY strong due to the increased vapor eliquid intake using a high wattage mod. Also, coming from smaller variable volt mods like the older Vamo & Innokin SVD, AND regular EGO pen style ecigs, they are no longer any good. Once you change over to a high wattage mod with 1 – 200 watt output anything smaller hardly produces anything compared anymore compared to the Cuboid. At just at 65 watts, with soaked cotton a 3 second hit will produce a huge throat hit and a massive cloud of vapor. Eliquid usage is much higher when using these higher wattage mods. You are vaporizing much more eliquid much quicker on the high wattage RDA coils. You’ll go through twice as much ejuice at the least using a RDA & a high wattage mode. Recommend finding a cheap ejuice supplier. Flavor is much better though, and vapor is massive. Max VG if your into clouds of vapor. Using “TC” temperature control mode,, conserves eliquid and coils last longer using “TC” mode. Nickel wire should only be used in “TC” mode. I use stainless steel wire myself in “TC”. Great prices, sales incentives and fast shipping. “Blueberry Muffin” is VERY tasty! VERY quick shipping. 30ml $7.97 / 50 ml $12.50 with great sales and discount codes at times. Takes over a week to receive. USPS mail system from there location must be using “pony express” mail. Tracking never seems to update from there USPS location. Discounts on website. Tombstone, Mystik RY4, or 5-Five-5 tobacco eliquid are my favorites. Use discount code 10off for 10% off. Not the cheapest, but if your looking for good tobacco eliquid try Tobacco Blaze or Buds Blend! Best tobacco eliquid I have tried as of yet. Quick shipping. Great prices and sales. Beware, can take 2+ weeks to receive order. And they tell you about “processing time” on there home page. First order took 16 days to receive. No juice whether cheap or even expensive is worth waiting that long. With a RDA (rebuidable drip atomizer) you do need to re-drip frequently. Otherwise like I experienced a few times, I vaped the cotton to dry and got a few “flame outs” up into my mouth, LOL. That is not very nice thing to experience. Kanthal wire and organic cotton is very cheap. With a little know how, and a good ohm resistance meter, you can make your own coils. Many videos on youtube will show you how. Temperature control mode works great with nickel, titanium or stainless steel wire. I personally use stainless steel wire, which can be used in wattage OR “TC” mode. Takes some setting adjustments to find the sweet spot. Locking the coil resistance when using “TC” mode is a must. Coils and batteries last longer in “TC” mode which is a big plus. Temperature control mode is a much more controlled vape, you can make it a hot vape, or a longer cooler vape. If your wattage is to high, it will hit your temp setting quickly. So increasing temp setting or lowering wattage is the key. This is my first experience with a temperature controlled device, and I must say I like it! After a year or so on drip RDA’s I’ve decided to go back to regular clearomizers or quit vaping altogether. E-Liquid usage is MUCH, MUCH higher using an RDA. Probably been spending 3-4 times more in e-liquid from when using clearomizers. Can only go 2-3 days before having to re-wick with new cotton. Coils, depending on the eliquid and wattage have to be changed out for me anyway every 4-5 days. And that is with cleaning, running coils under water and dry burning off. The Cuboid after a year is showing signs of usage. Mine is black, black paint or power coat is wearing off, dis-colored where you grip the Cuboid. Screen how ever is free of scratches though. Thanks for sharing! 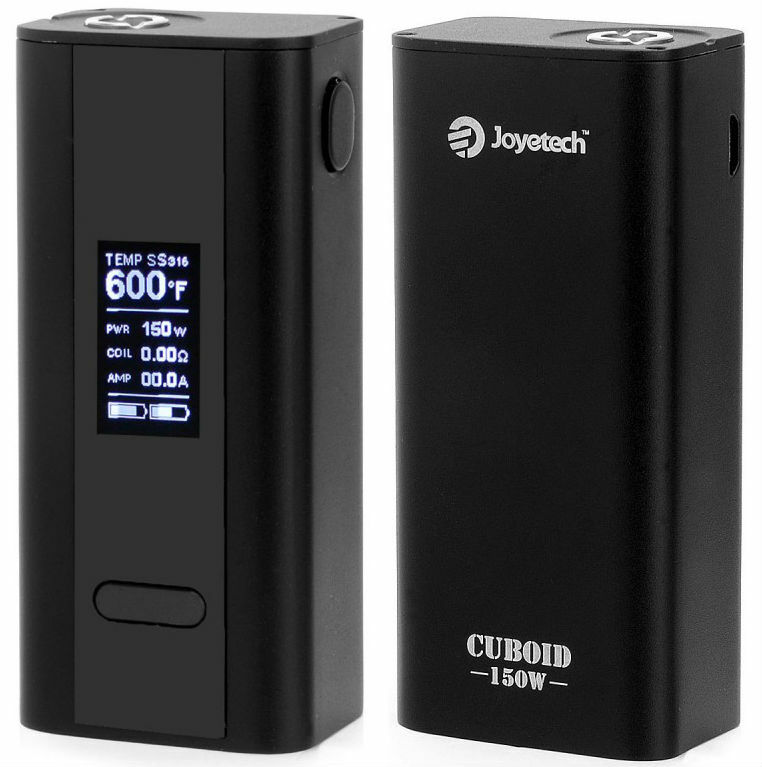 I always wanted to try the cuboid 150W. Finding a good vape can be confusing especially with all the styles out in the market. Always keep it in mind that a good vape should always have excellent flavors, durable quality, great battery life and produces enough cloud smoke. Checkout vape stores online like https://ecig-city.com/ to get more information.